7 Times We Absolutely Loved *Coordinated* Outfits On Bridesmaids! There is no event more exciting in a girl’s life than her best friend’s wedding. Being a bride is beautiful, but also brings a lot of anxiety along the way. 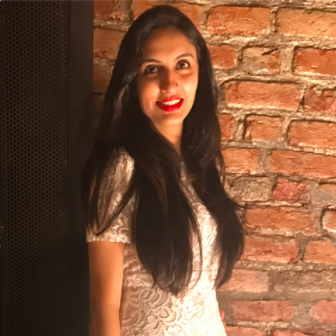 In sharp contrast, a bridesmaid gets to have all the fun and also has the sole responsibility of making her bestie’s shaadi an event to remember. That’s not all, if you are a soon-to-be bridesmaid, then you could finally get that heavy lehenga out of the closet and get dressed to kill! And since it’s a special occasion, why not coordinate your outfits with the fellow bridesmaids. Here are 7 times when we loved coordinated outfits on bridesmaids. This is what we call legit outfit coordination goals. The bridesmaids wore similar outfits - floral crop tops and an orange skirt which looked so pretty! But the best part was that all the bridesmaids’ outfits were coordinated with the bride’s outfit and it made for just such a pretty picture. A funky bride and her funkier bridesmaids... We totally loved the fun beach vibe of this bride and her bridesmaids, who wore contrasting identical blue and pink crop tops and skirts. And they seem to be totally enjoying the moment, which is so cool! 3. Patiala suit and Punjabi swag! There is nothing that looks better on a pretty gang of girlies than a swagger patiala suit in pastel hues. 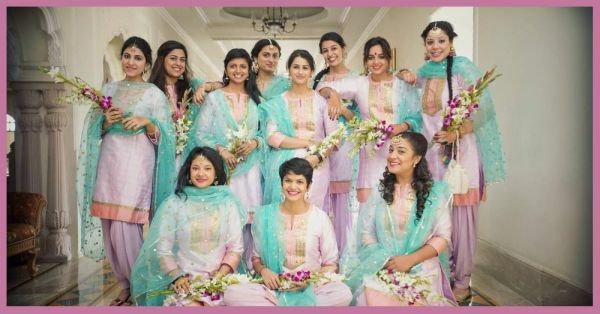 And these beautiful bridesmaids totally nailed their coordinated looks in their pastel pink patiala suits and glittery blue dupattas. The gorgeous orchids added that extra dose of charm to the picture. We just cannot get over the quirk quotient of this picture. The bridesmaids all wore different coloured stockings underneath their lehengas which was such a visual treat. Goals, literally! 5. Making ‘em go ‘green’ with envy! We cannot stop admiring this gorgeous picture, not just because of the insanely pretty backdrop, but because of how well coordinated the bridesmaids and their outfits are. They look so stunning in those mint green and aqua blue lehengas, which totally complement the bride’s dark blue outfit. 6. ‘Coz nothing beats pink and yellow! Pink and yellow are the evergreen colours of weddings. Even if brides these days prefer unique colours for their wedding outfit, they still love opting for these bright and vivacious hues for at least one of their shaadi functions. The bride’s bridesmaids made sure to accompany her in colour coordinated pink and yellow outfits of their own and look how pretty they all look! 7. Helping her keep the wedding blues at bay! Because what are friends for, after all! This beautiful bride looks like a vision in white and stands out from her all-blue bridesmaid bunch. The stunning besties decided to wear coordinated blue gowns and looked oh-so-elegant! We dig! We loved all of these stunning coordinated bridesmaid outfits… Which one’s your fave?